I've already made the connection between rhizomatic thinking and the general shift in science and culture from mechanistic, reductionist thinking to organic, wholistic thinking. It encourages me, then, when I find evidence that people with other interests than my educational concerns are thinking rhizomatically, even if they don't use the term. This past week, I came across a wonderful article called Embracing Emergence: How Collective Impact Addresses Complexity (2013) by John Kania and Mark Kramer, both of whom are consultants to private, public, and charitable organizations. Kania and Kramer use the terms emergence and complexity, but their discussion resonates with rhizomatic thinking for me, and I think what they have to say about the way organizations are beginning to address complex issues is relevant to rhizomatic learning as it addresses complex issues within an educational context. Collective impact poses many challenges, of course: the difficulty of bringing together people who have never collaborated before, the competition and mistrust among funders and grantees, the struggle of agreeing on shared metrics, the risk of multiple self-anointed backbone organizations, and the perennial obstacles of local politics. We believe, however, that the greatest obstacle to success is that practitioners embark on the collective impact process expecting the wrong kind of solutions. The solutions we have come to expect in the social sector often involve discrete programs that address a social problem through a carefully worked out theory of change, relying on incremental resources from funders, and ideally supported by an evaluation that attributes to the program the impact achieved. They could, of course, be writing about MOOCs, which often confuse participants who expect "the wrong kind of solutions" and the wrong kind of organization and who can't even find the metrics for learning, much less agree on them or apply them. The solutions expected in the social sector sound a lot like the solutions we expect in education: discrete classes that address a specific subject through a carefully worked out theory of education, relying on incremental resources from the school, and supported and validated by an assessment regime that attributes to the student the learning achieved. In other words, just like the educational sector, the social sector wants to force complex problems into the simple domain with discrete, well-defined problems that can be addressed in well-defined spaces through well-defined heuristics within a well-defined funding cycle by a well-defined entity who will be held totally accountable for the well-defined, predetermined results. As Kania and Kramer say it, "The problem is that such predetermined solutions rarely work under conditions of complexity—conditions that apply to most major social problems—when the unpredictable interactions of multiple players determine the outcomes." That sounds like most of my classes in writing and literature, which are addressing complex issues rather than the merely complicated or simple. The process and results of collective impact are emergent rather than predetermined, the necessary resources and innovations often already exist but have not yet been recognized, learning is continuous, and adoption happens simultaneously among many different organizations. In other words, collective impact is not merely a new process that supports the same social sector solutions but an entirely different model of social progress. The power of collective impact lies in the heightened vigilance that comes from multiple organizations looking for resources and innovations through the same lens, the rapid learning that comes from continuous feedback loops, and the immediacy of action that comes from a unified and simultaneous response among all participants. Shared measurement: Collecting data and measuring results consistently across all participants ensures efforts remain aligned and participants hold each other accountable. Mutually reinforcing activities: Participant activities must be differentiated while still being coordinated through a mutually reinforcing plan of action. Continuous communication: Consistent and open communication is needed across the many players to build trust, assure mutual objectives, and create common motivation. Backbone support: Creating and managing collective impact requires a separate organization(s) with staff and a specific set of skills to serve as the backbone for the entire initiative and coordinate participating organizations and agencies. All of the successful MOOCs that I have taken, including ETMOOC, meet most of these conditions: a common agenda, mutually reinforcing activities, continuous communication, and backbone support. The weakest aspect of MOOCs appear to be in shared measurements, but I think the term itself suggests a way forward. Assessment should be a shared activity in which all participants collect relevant data and measure results consistently, or at least transparently. Assessment should not be left to a single, over-arching authority who is independent of, and thus superior to, the learning community. Rather, assessment should be part of a continuous feedback loop that informs the activities of the learning community from which the learning emerges. I confess up front that I am not an expert on assessment. Moreover, I am locked into passing judgement on my students by a school that demands a grade before it will issue a paycheck. Still, I have found some ways to change grading in my writing classes. For instance, I blog along with my students, and they comment on my blog as I comment on theirs. I do not grade their blogs, only their formal papers. I converse with them in their blogs. If they write something interesting, I comment. If they don't, then I'm silent, or I push them—just like a real person and not their teacher. I let them see that I am still learning, still trying to figure things out, still saying dumb things that later I'm embarrassed about. Just like a real person and not their teacher. So does the rhizome bring anything to connectivism that it doesn't already have? I don't really know, but I do know that the rhizome helps me think about connectivism in ways that I otherwise find difficult. I also find rhizomatic thinking familiar and evocative for a teacher of writing and literature. To my mind, the rhizome is a metaphor, not a model. A model is created to represent something else, often eliminating much detail and changing the scale to focus on some salient aspects of interest to the model creator and to make handling easier. The rhizome does not model the educational process (or any other process) in this way. Rather, the rhizome is more a metaphor that evokes the way reality works by comparing it, in some points but not all, to the way a rhizome works. The rhizome is evocative rather than descriptive, and it is in no way prescriptive. Evocation works well for me, but the more explicit minded may find the rhizome irrelevant and distracting. 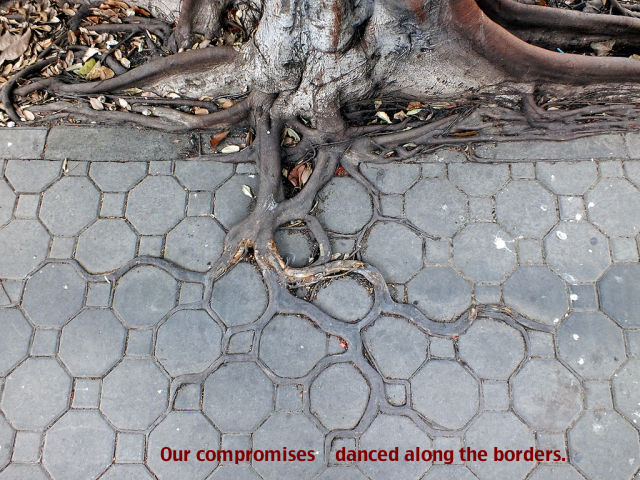 One cannot take the rhizome as metaphor too literally, then. For instance, some have complained that rhizomes are a multiplication of the same plant over and over, and they find little appeal in this kind of mindless repetition, especially when applied to learning. These people are taking the metaphor too literally. The rhizome of Deleuze and Guattari is not a homogeneous botanical system; rather, heterogeneity is one of the six characteristics of their rhizome. As they say, "Any point of a rhizome can be connected to anything other, and must be" (7). Homogeneity, then, is not one of the points at which Deleuze and Guattari's compare rhizomes to reality. A metaphor invites one to explore all connections between the two things compared, but not all connections will prove useful or enlightening. Love is a rose, but not in all aspects. If I understand the rhizome correctly, then, it is a metaphor of reality similar to the Enlightenment metaphor of the clock. Just as Galileo, Newton, and Descartes gave us the image of a clock to help us envision how the way too big Universe works, Deleuze and Guattari give us the image of a rhizome to help us make the shift from a mechanistic universe to an organic universe and to the math, science, and technology that make sense of that much expanded, different universe. Both the clock and the rhizome, then, are conceptual metaphors or frames, as Lakoff calls them, that describe reality in terms of either a piece of machinery or a plant; however, reality is neither a clock nor a rhizome. Still, I want to say that Deleuze and Guattari's marvelously twisted rhizomatic prose is about as close as one can get to the quantum, relativistic universe without way more math than I have. The rhizome is a wonderful metaphor in almost natural language for the complex systems that physics has almost completely accepted but still largely describes in mathematical terms—terms that I don't understand. This may be one of the most important contributions that the rhizome of Deleuze and Guattari makes to connectivism: it emphasizes the shift from a mechanistic, reductionist reality to an organic, relativistic, quantum reality and it captures in natural language something like this new reality. In his definitions of connectivism, George Siemens talks about complexity and chaos theories, but his language does not capture complexity and chaos the way Deleuze and Guattari do. Of course, Siemens has a different audience and different objectives than did Deleuze and Guattari. Still, there are things you can come to understand only by jumping in over your head, and as Mark Twain wisely observed, "If you a hold a cat by the tail you learn things that you cannot learn any other way." Reading Deleuze and Guattari is like holding two cats by the tail. Most people are willing to forgo that joy, but I have found it an endless source of enlightenment. That description of how to act in a MOOC sounds just about right as a description of rhizomatic learning. The knowledge lives in the community, you engage with it by probing into the community, sensing the response and then adjust. Just like the rhizome. It is a learning approach that is full of uncertainty… not least for the educator. But its one that allows for the development of the literacies that will allow us to sharpen our ability to participate in complex decision making. Dealing with the uncertainty is what the learning is all about. This, then, is a second important contribution of rhizomatic learning to connectivism: a focus on complexity. Rhizomatic thinking enriches the connectivist conversation, and it has allowed me to say things that I could not say otherwise. Deleuze and Guattari have given me language to speak of complexity. I think most of what i criticize or, at least, what concerns me about education is the movement between the complicated and simple domains. Our bureaucracies encourage simple domain learning, things that can be tracked and analyzed. Research goals seem to attempt to take things from complicated domains and shove them down into the simple one. Our world is increasingly one where complex decisions need to be made… and thats the kind of education i’m interested in being involved in. Most of education seems calculated to force all knowledge into the simple domain, with one source for truth and one answer on the test. Sophisticated instructors and some graduate programs allow for the complicated domain where "the relationship between cause and effect requires analysis or some other form of investigation and/or the application of expert knowledge" (Wikipedia). Traditional education, by and large, eschews the complex domain, where "the relationship between cause and effect can only be perceived in retrospect, but not in advance." Our traditional testing regimes demand clear answers and outcomes, and complexity refuses to play that game. Thus, our curricula try to make reality as simple as possible throughout most of K-16 education, only grudgingly admitting the complicated and almost totally denying the complex. The problem here is that most of reality is complex or chaotic. As near as I can tell, the truly simple is extremely rare in Reality and the merely complicated is almost as rare. Everything else is complex and chaotic (about 99.999% by my calculations). If 99% of education is forced into the simple and complicated domains and 99% of life is complex/chaotic, then it appears that we have a mismatch between what we are teaching and what we need to learn. Rhizomatic learning can help address this mismatch. Okay, so I enjoyed the conversation about rhizomatic education over at Christina Hendricks' blog, You're the Teacher. In the conversation, I'm definitely championing rhizomatic, connectivist education, but why? I've been writing about this for a couple of years now, but can I state my point of view succinctly and reasonably clearly? Well, I can try. Learning is a network phenomenon. That's rather succinct, and owes deep apologies to neuroscientist Olaf Sporns, but I can say it with a bit more texture: learning is a function of our complex interactions across multi-scale physical, cognitive, technological, and social networks. For me, this is the DNA of a connectivist and rhizomatic view of learning, and everything else I say about learning will follow from this core idea. At least, I hope so. But can I defend my claim that learning is a network phenomenon? I think so, but in some ways, starting points always carry with them assumptions that one either accepts or doesn't, and they carry assumptions that the believer is quite often unaware of. I think my use of networks falls into this category. However, I can point to some reasons why I use the concept. Networks provide me a most useful model of how the Universe/Reality/Everything works, including learning. Of course, as soon as I say that, I am reminded of George E. P. Box's famous dictum that "essentially, all models are wrong, but some are useful" (Empirical Model-Building and Response Surfaces, 1987). I am convinced that, despite how right network thinking feels to me, eventually people will come to see the faults with the network metaphor just as we are coming to see the faults with the mechanistic clockwork metaphor that we inherited from Galileo, Newton, and Descartes. As Edgar Morin has pointed out in his book On Complexity (2008), the mechanistic, clockwork model of reality and the science and technology built upon it has been spectacularly successful, but over the past century, cracks have begun to appear as we have come to see more of Reality, especially at the macro and micro levels. As we peer into our scopes, bits of reality emerge that no longer fit the clockwork model. Reality is stubborn, so we change our model. But slowly, sometimes too slowly. The model that appears to be replacing the mechanistic clockwork model is networking. Of course, not everyone uses that term. Edgar Morin speaks of systems, especially complex systems. In his book Interaction Ritual Chains (2005), Randall Collins defines the core sociological unit not an individual but the situation, a dynamic nexus of intersecting vectors which to my mind requires a network structure. James Lovelock calls it Gaia, the movies call it The Matrix. All of these sources have valid reasons for using the term that they do, but to my mind, networking (and here I'm using the verbal form intentionally to capture the complex dynamics in my concept) is the most convenient and natural-feeling term. I spent many years of my professional life building campus networks and connecting students, faculty, and staff to the Internet, so it just works for me; however, I also frequently use the term rhizomatics or rhizomics to play off Deleuze and Guattari's concept of the rhizome (A Thousand Plateaus, 1988), a more free-form, complex, dynamic, and inclusive form of networking that reveals some properties that I find particularly useful and fun. I have joined #ETMOOC late, but I'm glad that I joined. This week we are sharing stories, and I've chosen two. The first is a six-word tale with image (I found the image Nature Adapting to Man on Weird Twist). The second tale is a repeat of something that has happened with every MOOC I've joined so far, but it's still a fine story. So grab a beer or coffee, pull your chairs in close, and let me tell you what happened to me this past week. I started digging into the ETMOOC website to orient myself into what is going on. I'm interested in educational technology and MOOCs, so I was confident that I would find something worth following. Boy, did I. The first thing I discovered was that I had again missed Dave Cormier's talk about rhizomatic education. This is a great disappointment for me as I am also exploring the life of the knowmad, and I think Cormier has some genuine insights. Fortunately, I followed a link to the recorded archive of the talk, and somewhere along the way, I found a link to Christina Hendricks' wonderful post Etmooc: Rhizomatic Learning–A Worry And A Question on her blog You're the Teacher. That's when the rhizomagic started. I sat in on a wonderful campfire conversation about the relative merits of rhizomatic learning. Christina suggested some initial attraction for the concept, but she also had some real reservations. Both her interests and concerns were shared by Brendan Murphy, Caleb Kelly, Claire Thompson and others. To my mind, what they were saying was not nearly so important as what they were doing: collecting themselves together to discuss an issue important to all of them, engaging in the very best of rhizomatic learning, and I could join in. For me, this is the beating heart magic of rhizomatic MOOCs: they enable people to connect to a topic and to each other to explore that topic. It's happened to me every time I've engaged a MOOC, and I deeply appreciate reliable magic. Recognizing the magic, however, does not mean that I am ignoring the issues with MOOCs and other forms of rhizomatic learning. The catastrophic failure of the Georgia Tech MOOC this past week and the nagging problems with assessment and certification demonstrate that we have not worked out all the bugs. Actually, I don't think we will ever work out all the bugs before MOOCs have morphed into something else, the next over-hyped big thing. But I am absolutely convinced that we are learning to use educational technologies to accomplish important goals and that what we learn will change what we do. I intend to enjoy the ride.